This easy to make Skull Bath Bomb DIY is a great DIY Halloween gift. Halloween bath bombs are nice to give kids as a cute alternative to candy too. Just make sure it is clear what they are. 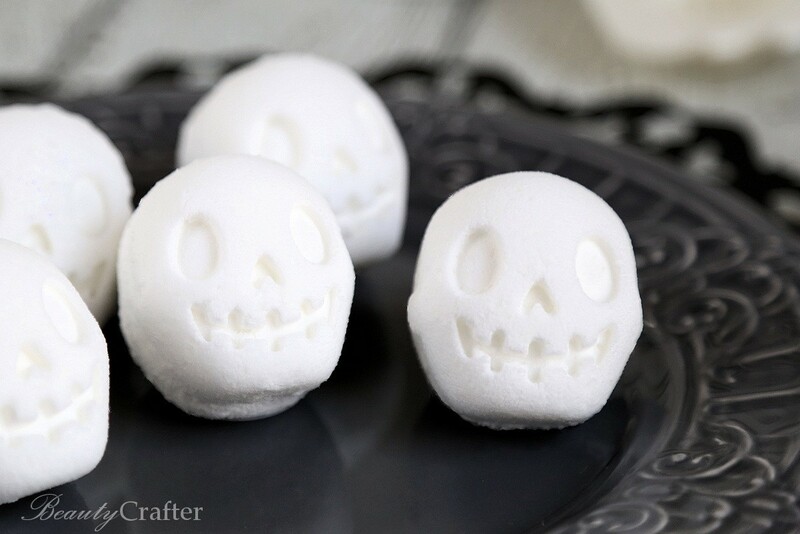 These DIY Halloween Bath Bombs are not creepy at all they are cute little guys and perfect for kids or anyone who prefers a more lovable skeleton look. Each skull bath bomb is 3d, thanks to the use of a Japanese style boiled egg press mold. I’ve used this style of mold to make bath bombs on many occasions, especially when making bath bombs for kids (bunny, fish). In the past I have typically used one side of the mold leaving the bottoms flat, this little guy definitely sports his 3d look well. You will need this exact mold to make these kid-friendly skull bath bombs. Of course you can also use the mold to press eggs as intended. The cute skull mold would also be handy for other Halloween crafts too. I expect it would work well with paperclay and I may try making cake pops or truffles with it on my food blog, Mom Foodie. I kept this skull bath bomb recipe very simple. Their is no colorant in it, so great for those sensitive to dyes. I scented mine with vanilla oleoresin , which is the closest equivalent of essential oil for vanilla. I love the way it smells, but if you have kid friendly essential oils such as lavender or lemongrass, by all means use those if you like. Do not try and substitute vanilla extract. The scent will not last well and some will react with the bath bomb mixture adding to expansion risk. While it is usually advisable to make any bath bombs on a lower humidity day to avoid expansion due to absorbing moisture from the air when they are supposed to be drying out, with shaped bath bombs it is even more essential. Trust me I’ve learned the hard way…. when my first batch of Little Fish Bath Bombs turned into bloated puffer fish…lol. Full instructions and measures below. 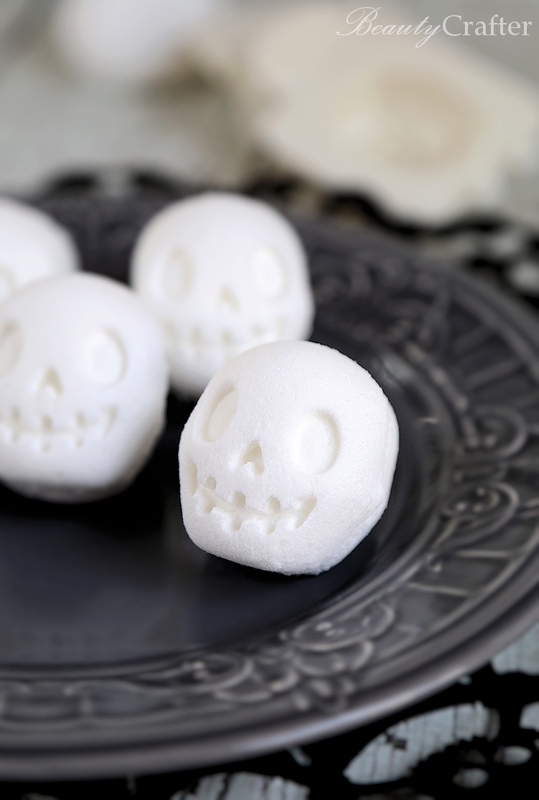 Thes cute DIY skull bath bombs are easy to make and great for both kids and adults. Whisk together the baking soda, cornstarch, citric acid and epsom salts. Add the coconut oil, vanilla oil, and mix thoroughly. Add the water while mixing to avoid a reaction. Start with the minimum amount of water, and add just until grasped mixture lightly clumps. Scoop mixture into each side of mold and press gently to ensure details will be clear, then overfill each side and firmly press together. Lift off back half of mold and gently remove the excess mixture. Flip the skull bath bomb over and remove the front of mold. Allow the bath bomb to dry for a few hours before storing in airtight packaging. *While unrefined coconut oil has fantastic benefits, it is used here mostly for it’s great scent, which teams well with the vanilla making a candy/dessert type smell. Rubber Ducky Soaps – Easy DIY Soap… Perfect for Spring! Lemon Sugar Scrub with Free Printable Labels – Fabulous DIY Gift!